A Shenandoah Sampler: Richmond Sampler framed! It is a beautiful Sunday morning here in the Shenandoah. I do hope those who live in the mid-section of the country are faring well. What horrible storms! I have been Missing In Action. I am not going to offer excuses - there are many! Instead I would like to say thank you to all of you who sent emails checking up on me! They meant so much! I have been stitching, believe it or not! The project I've been working on is The Sparrow. I will post progress of that in another post. The Sparrow and I are NOT getting along right now and we are taking a short break from one another. We will make up later today but for now it is best that we not be in the same room. However, I would like to share Richmond Sampler - framed! Terri from Cross Stitch Station in Waynesboro, Virginia framed the sampler and words cannot express how thrilled I am with how it turned out! It is stunning! Terri did a superb job even when the sampler did not want to cooperate. As many of you know, this sampler was a long time project and it traveled with me to many places. So, the linen was, ummm.......shall we say.......well used and not easy to work with when it came to lacing and keeping things even and lined up. Terri laced it and re-laced it and finally the sampler was, as Goldilocks said, "JUST RIGHT!" So without further ado, here she is...Richmond Sampler - Anne Maria Clarke framed and on my living room wall. I struggled to get good pictures. I apologize for the glare but hopefully you can get an idea her beauty! The frame is from Shenandoah Framing (fitting, don't you think?) Shenandoah Framing is about four miles from my house but I wanted Terri at Cross Stitch Station to do all of the actual framing. She ordered the frame but took care of lacing, spacers, glass, etc. I. LOVE. IT! Thank you all for stopping by! I hope everyone has a fabulous week! Such a beautiful sampler and the frame fits it perfectly! Oh my! It's gorgeous! You must be so thrilled to have Anne Maria Clarke on your walls. I love that frame! I hope stitching gets better for you -- good to see a post from you! Your frame is perfect for the piece! How beautiful. I know that you have to be so thrilled to finally have it hanging on your walls and Terri did a fantastic taming that well loved fabric!! Congratulations!! As I said before, Richmond is stunning and the frame moulding you selected suits her perfectly! Sorry to hear that you and The Sparrow are fighting again! Hopefully, your solution will take care of the issue! Oh, Val, it is exquisite and the frame choice is perfect for it. Thanks for the close-up so we could see the grain in the wood. I know you will smile every time you see her on the wall. Absolutely gorgeous! Terri did a great job lacing - it looks perfect and the frame couldn't be prettier! I love that the Richmond sampler has a Shenandoah frame. Congratulations! I hope you and that sparrow reconcile quickly! Just gorgeous! Terri did a wonderful job with your sampler and that frame is beautiful! Beautiful and I love the burled wood frame; it goes really well with the period of the sampler. Wonderful framing! Love the moulding. I am so sure you are so happy to have her hanging on your wall. The frame is gorgeous and just perfect for your gorgeous sampler. I hope you and The Sparrow have made up and are friends again! Absolutely stunning piece, Valerie!! 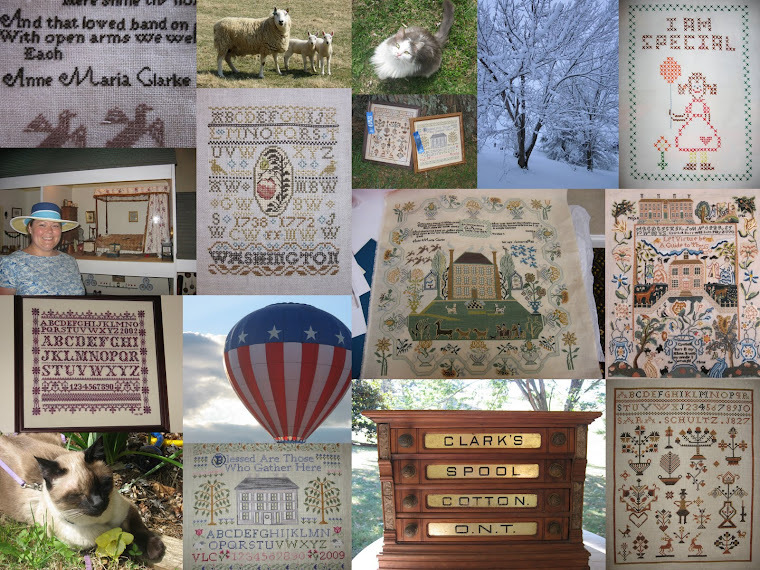 You live in such a beautiful part of Virginia--this sampler just adds to that beauty :) Congratulations! Oh it is so nice to finally see it in full, complete beauty. Great job. How appropriate for your location! I love the details in the sampler and your framing choice. Oh your Richmond looks wonderful all framed and hanging. Hope you and your Sparrow make up soon lol. - Sandra. THe Richmond sampler looks gorgeous framed. I hope you and your other piece make up before too long. What a great framing job Valerie! So nice to see this one is now hanging in your home. Such a beauty. Beautiful frame choice. What an accomplishment. This is a beautiful sampler. What a gorgeous frame, Valerie! Many congrats on having Anne Maria on your wall - she is so pretty! Valerie, Your Richmond Sampler is simply stunning! The frame is perfect! Congratulations! Gorgeous frame!!!!! Love, love, love the sampler. LOVELY! I am sure you are thrilled. stunning finish :D I love the simple frame. Congratulations on your finish! It's truly stunning! I love the frame! Oh my gosh--it looks SOOOOO great, Valerie! Wonderful choice of frame moulding, too. Perfect frame to compliment your sampler! Your finish is stunning! Ohhhhh, a beautiful sampler in a beautiful frame. The effect is gorgeous! It is absolutely stunning, Valerie.....the frame is perfect! Your sampler looks sooooooo beautiful! Congratulations on your beautiful stitching of 'Anna Maria Clarke', displayed in your choice of an exquisite frame too!